Control Panel Design | The Industrial Controls Company, Inc.
Panel Development — We Design It. We Build It. The Industrial Controls Company’s blend of engineering and manufacturing capabilities provide us with a unique perspective on the control panel design and development process. We design with the build in mind. Leveraging our experience in lean manufacturing, we make design choices during the engineering phase that help us maximize efficiencies of time and materials during the assembly process. 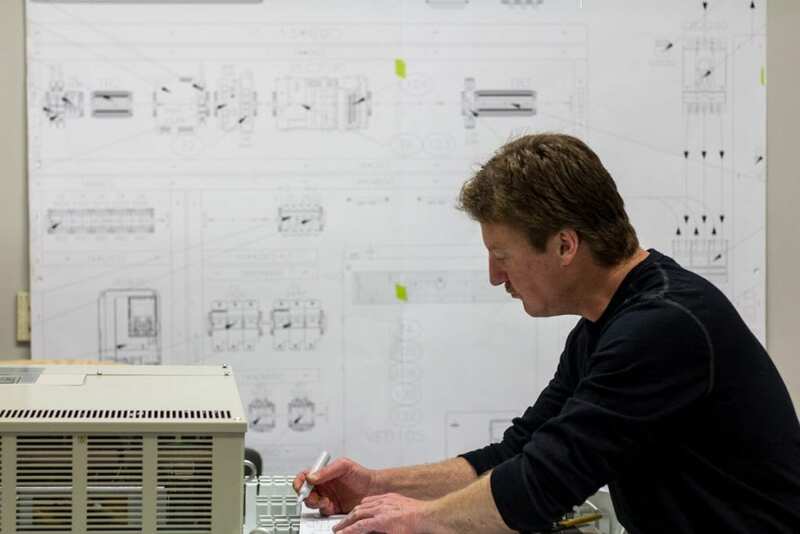 The routine feedback our engineers receive from the shop floor give us a wealth of practical insight to translate your requirements into “build-ready” designs. By focusing equally on the engineering of the control panel and the protocol for its manufacture, we create solutions that target the “sweet spot” on the cost/performance curve. A full quarter of our employees and managers are degreed engineers. That’s over 150 years of combined controls-engineering experience under one roof. Decades of experience in industry sectors ranging from semiconductors to wastewater management have prepared us to anticipate the challenges your system will encounter in the field. We understand control panels and control systems as a specialized discipline — one with unique challenges posed by automated systems that must sense and interact with complex sets of cues from the work environment. All our custom control panel designs aim for consistent and dependable real-world performance, with particular attention paid to safety, expandability and serviceability. Long-standing relationships with a network of proven vendors give us an edge, not only on pricing, but on access to the best in available components. The Industrial Controls Company works closely with customers to precisely define your control panel design requirements and to gain a thorough understanding of the environment where your application will perform. Our process aims for seamless alignment between our engineers and yours, insuring in-depth understanding on all sides. We provide you with detailed schematics as well as full documentation for each step in the cell-based manufacturing protocol created for your project, right down to the layout of the workstations to detailed photo documentation of the assembly process. This complete package allows your control panel design to easily re-up for production, anytime the need arises. Contact The Industrial Controls Company to discuss the custom control design and engineering projects on your horizon.